Presently staying in sunny Glenelg, quite the tourist hub. Found a very nice apartment on Colley Terrace which is just opposite the beach. 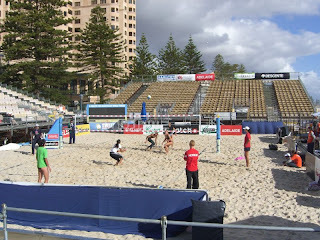 Didn't realise when we made the booking that the World Beach Volleyball Tour was being held practically on our doorstep. Quite a huge event with lots of tall, athletic types from all over getting around. 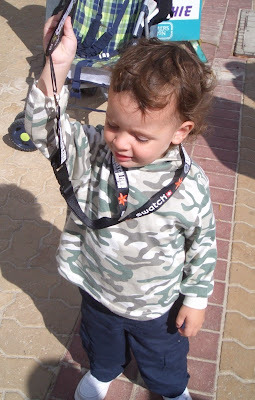 Eljay scored a lanyard and other merchandise from the sponsor, Swatch, when we walked by yesterday. He must've flirted with the nice lady handing out the merchandise as none of us grown ups were offered anything! CF & PTA spent a while arguing over who was going to keep the lanyard, looks like CF won that round.